The Kirkham Project pedestrian entry, stairs and retaining wall along Kirkham Street provides an opportunity for installation of Watershed Materials’ blocks as both structural and decorative applications. Watershed Materials is teaming up with Westlake Urban and Alpha Group to explore a solution to a problem that real estate developers often face – excavation that has to be moved off a construction site to make way for new buildings. Rather than haul off the excavation spoils then import thousands of concrete masonry units (CMUs) for use at the project, the developers and Watershed Materials are working together to repurpose native excavation material right at the job site to create the structural masonry blocks used in the development. Truckloads of offhaul and truckloads of imported building materials could be eliminated by using the excavation to make the structural block, adaptively reusing waste to produce on-site building materials. The companies are working together to test the feasibility of the novel adaptive reuse strategy at the Kirkham Project, an urban infill redevelopment of the Kirkham Heights Apartments in the Inner Sunset neighborhood of San Francisco. Watershed Materials, a sustainable building materials startup funded by the National Science Foundation, develops technology for the production of structural masonry using high compression, low cement technology and using locally sourced, unwashed aggregates. The company has a pilot factory in Napa where it produces masonry blocks using aggregate sourced from local quarries. Watershed Materials has created a small, portable block production machine, a sort of pop-up facility, that can be located on the construction site at real estate developments to produce masonry block from the excavation spoils, much in the same way it produces block from unwashed quarry aggregate. The breakthrough in Watershed Materials technology is the discovery that applying very high pressure to a mixture of sand and gravel can turn those mineral grains back into a sort of sedimentary rock, mimicking the natural geological process known as lithification that creates stone from loose sedimentary material. What takes nature many millennia to accomplish is duplicated in seconds in Watershed Materials’ high compression masonry production equipment. Sample structural masonry block produced by Watershed Materials from soil samples taken at the Kirkham Heights Apartments in the Inner Sunset neighborhood of San Francisco. The block achieved a final compressive strength of 2,905 psi and a density of 131 pounds per cubic foot averaged over three specimens. The beautiful appearance comes from Watershed Materials’ ultra high compression technology combined with the native site material - a medium dense reddish-brown clayey sand with angular gravel and rock fragments. Blocks such as these are proposed to be produced on site at the Kirhkam Project redevelopment, made from repurposed excavation and used throughout the development site as structural and decorative masonry elements. The Kirkham Project proved an ideal opportunity to explore the feasibility of this novel approach. 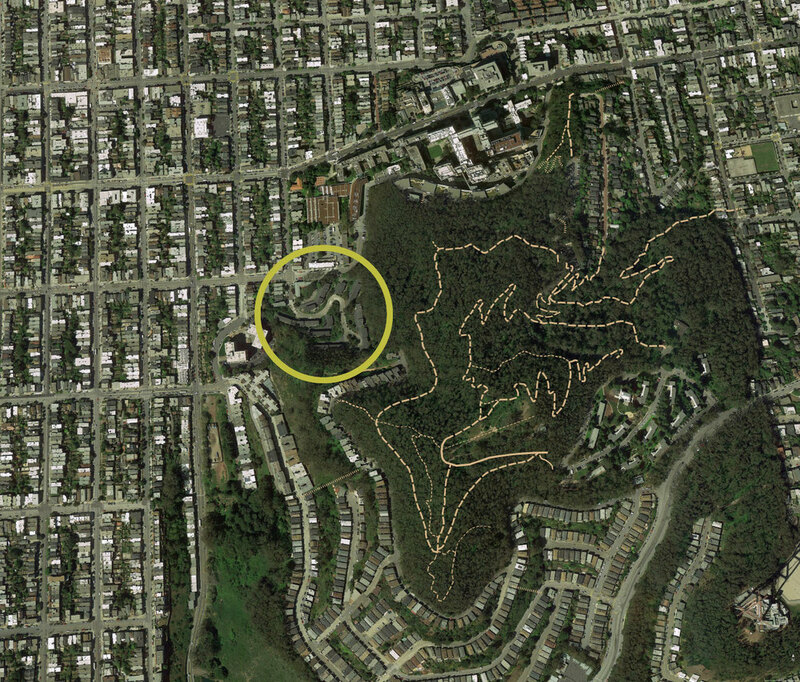 Nestled against the Mount Sutro Open Space Reserve in the Inner Sunset, the existing topography of the site requires excavation to create a new neighborhood that complies with the City of San Francisco’s Better Streets Program and will accommodate increased housing density, community open spaces and improved accessibility. Westlake Urban’s proposed development includes realigning 5th Avenue to create a new neighborhood of up to 445 housing units. The project will also include community plazas, gardens, and stairways to view overlooks of the Pacific Ocean and Golden Gate Bridge. The project addresses the City’s dire need for additional housing near a major employer (UCSF) and public transit, but some neighbors have expressed concerns about the construction truck traffic related to the the new development. Soil Testing: excavate 1’ - 5’ deep boring depth for Watershed Materials to test in its Napa lab then produce sample blocks and a report summarizing mix designs, compressive strength and density. The Kirkham Project site’s excavation proved ideal for producing masonry units using Watershed Materials’ high compression manufacturing process. 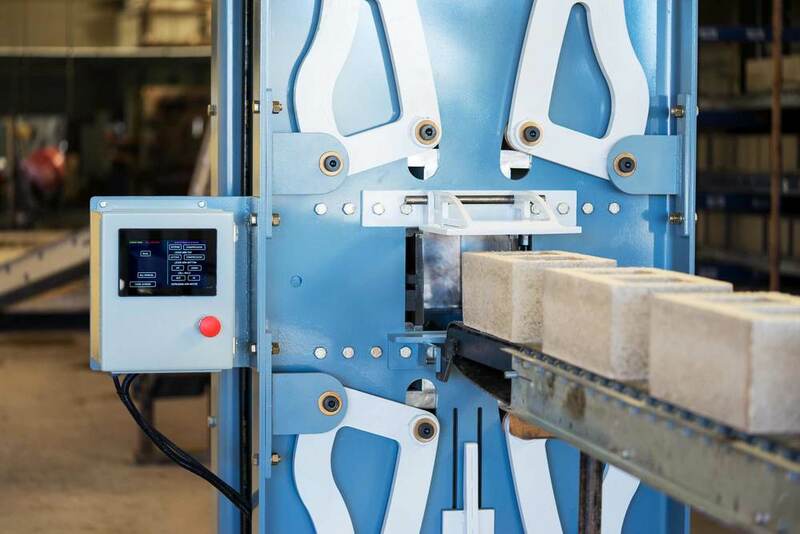 Sample blocks were produced with a compressive strength of 2,905 psi, significantly greater than conventional CMU blocks. Identification of Site Elements for Block Utilization: The development team identified the site elements that could incorporate masonry blocks as the primary building material, including landscape pavers, pedestrian pavers, retaining walls, foundation and garages. Take-Offs & Total Block Estimate: The architect, engineer and landscape architect prepared rough take-offs of the elements for block material. The development’s contractor is providing detailed square footage estimates for Watershed Materials to determine the total block utilization potential at the site. Reduces off haul. Kirkham Heights is an infill redevelopment project in an existing neighborhood. Producing block on-site allows for a reduction in the number of truckloads of off haul needed to remove excavation. Reducing off haul reduces costs, reduces diesel emissions and importantly reduces impact on the neighborhood. Aesthetic, indigenous sustainability. Watershed Blocks are a beautiful building material that help to tell the story of more sustainable development practices. Reuse of site material provides an excellent demonstration of an important and cost effective innovation in the real estate industry. 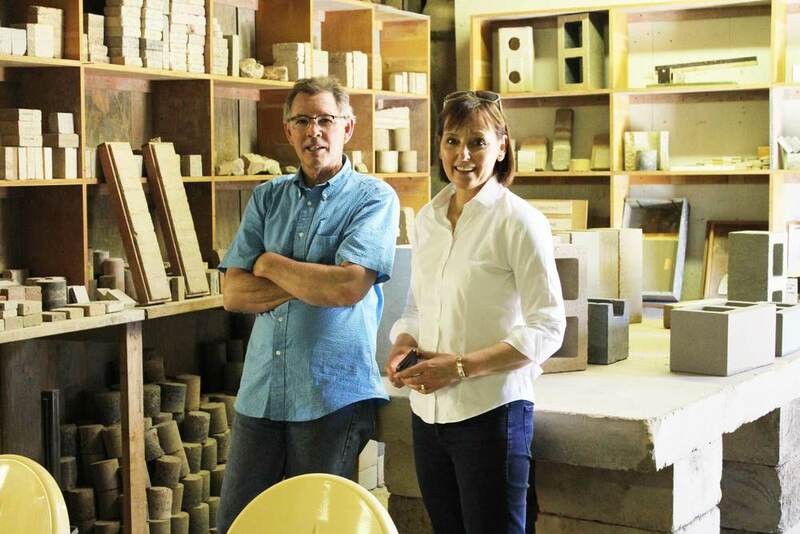 David Easton of Watershed Materials and Gaye Quinn of Westlake Urban at Watershed Materials’ lab in Napa, California, discussing the viability of making structural masonry units from repurposed excavation from the Kirkham Project in San Francisco. The Kirkham Project Community Plaza, a one-quarter acre accessible open space in the center of the development, provides excellent opportunities for installation of Watershed Materials blocks as pavers and landscaping features.